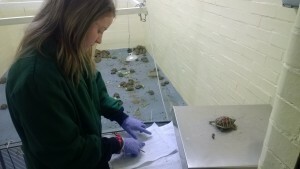 Shannon Summerell joined our Level 2 Apprenticeship in Work-based Animal Care programme in January 2013, going on to complete the Level 3 Advanced Apprenticeship in Work-based Animal Care in March 2016. We caught up with Shannon and asked her to share some of her experiences about her time on the courses. 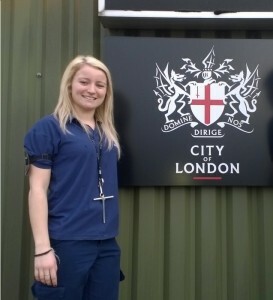 I started Animal Care Level 2 in January 2013 as an apprentice at the Heathrow Animal Reception Centre. I chose this course as the coursework related to the job role I wanted to have. Doing an apprenticeship was what I had in mind when choosing to study animals as I wanted to gain experience whilst studying, and I am extremely glad I did. I learnt so much through working which I was able to use in my coursework. I really enjoyed the different assignments that were set as I was able to lay them out how I wanted using photos and tables, and I could also choose the animals I wanted to write about in my assignments. I found the knowledge and understanding units the most challenging, however I enjoy being pushed and researching new things. I now have a permanent full-time job at the Healthrow Animal Reception Centre and am going to be starting a Diploma in the Management of Zoological and Aquarius Animals as of September. I would highly recommend the Animal Care Level 2 and 3 courses as they are enjoyable qualifications and look good on a CV! I would also recommend an apprenticeship as it really helps you through your qualification by gaining experience on a daily basis. Overall I am extremely glad I did the NVQs/Apprenticeships, and a big thank you to The College of Animal Welfare for having me and guiding me through.